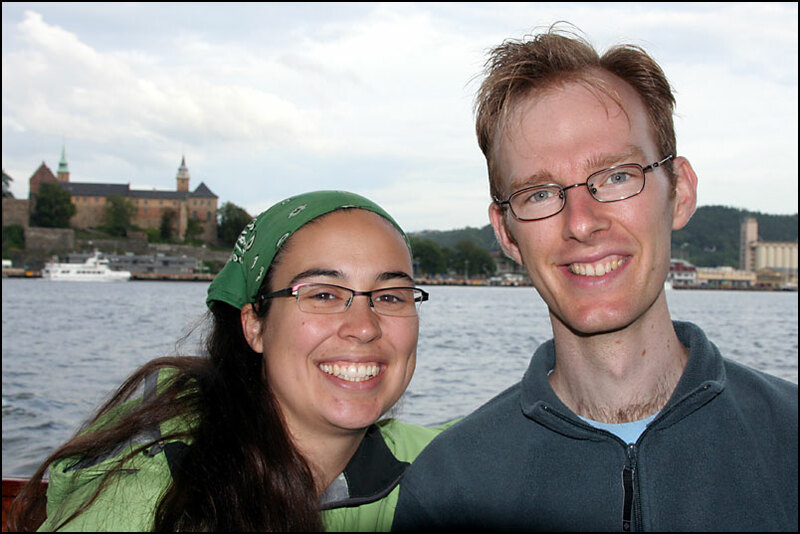 I spent two short days in Oslo on my way to the Netherlands, to meet up with Nicole and her boyfriend Patrick, who were visiting Patrick’s sister and her husband who live in Oslo – are you still following me? ;). 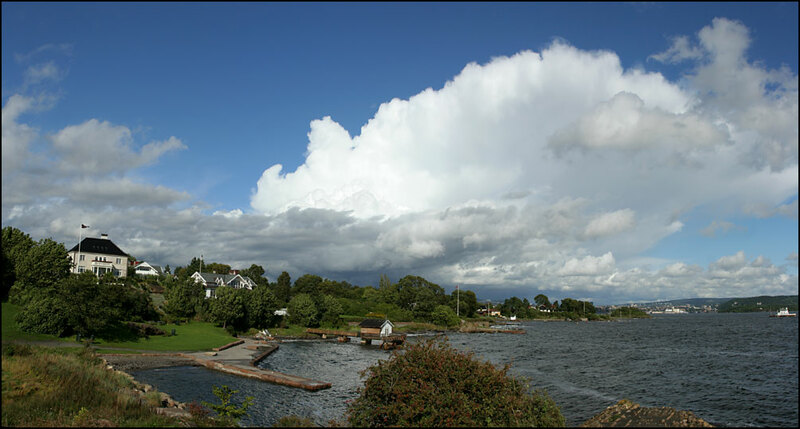 They live on Bygdøy, the “museum island” which is actually a peninsula. It’s a really nice area, and we went for a little walk to the beach on our first day. 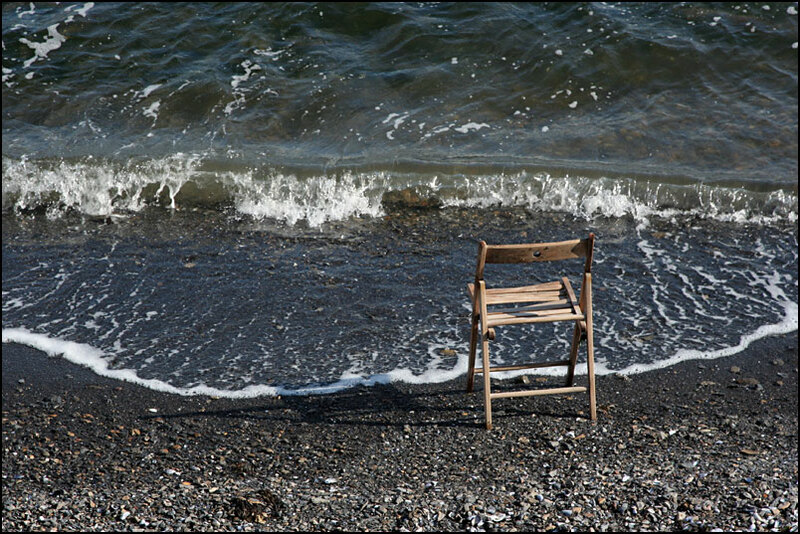 It was very windy, with some nice clouds, and we also found this abandoned chair on the beach. 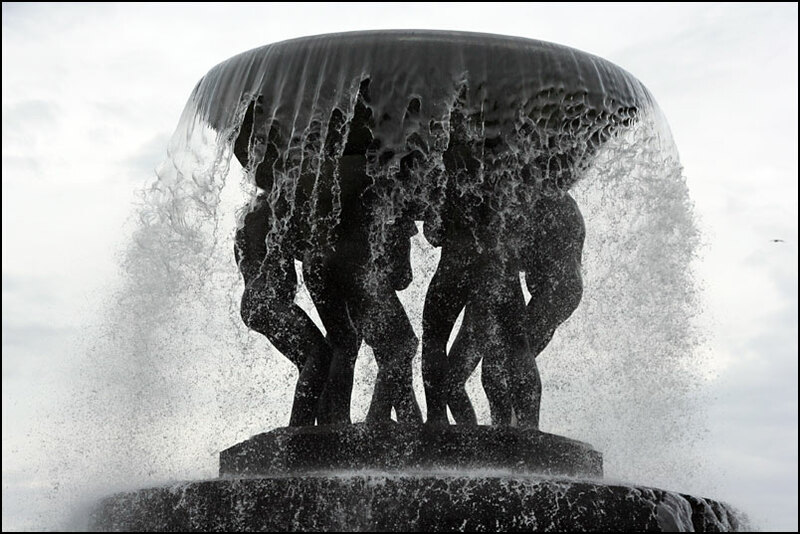 The next day we went to visit Vigeland sculpture park, a large park with a lot of granite and bronze sculptures by Gustav Vigeland. 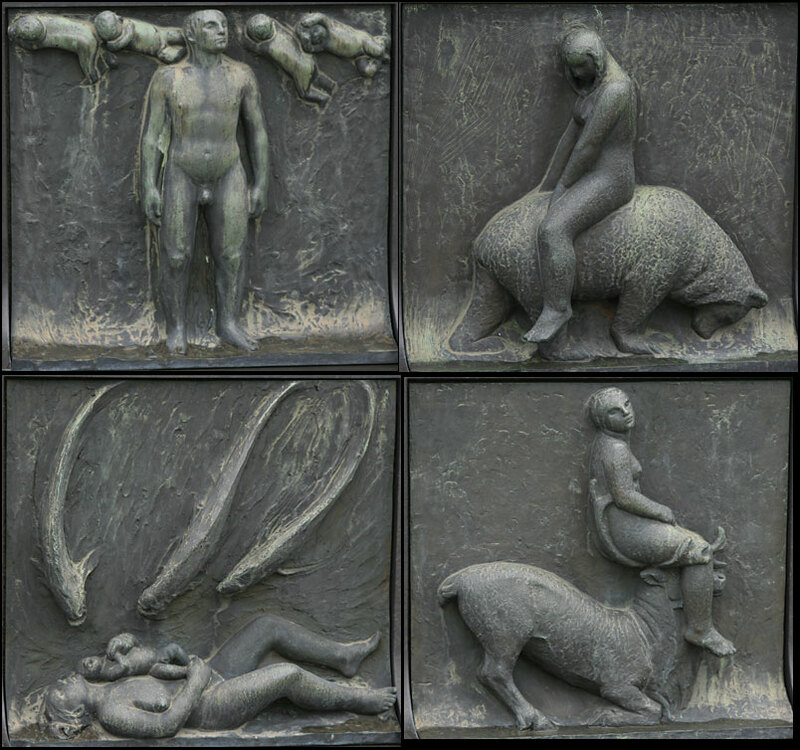 The overall theme of the park is man’s journey from cradle to grave. All sculptures show people in various scenes of life. 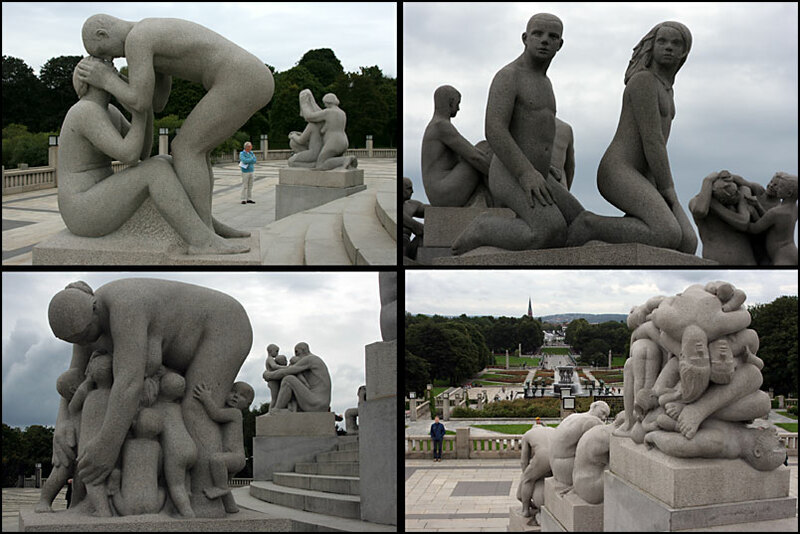 Some people find the sculptures disturbing, I think mostly because the people in it are naked, but I think that’s missing the point. 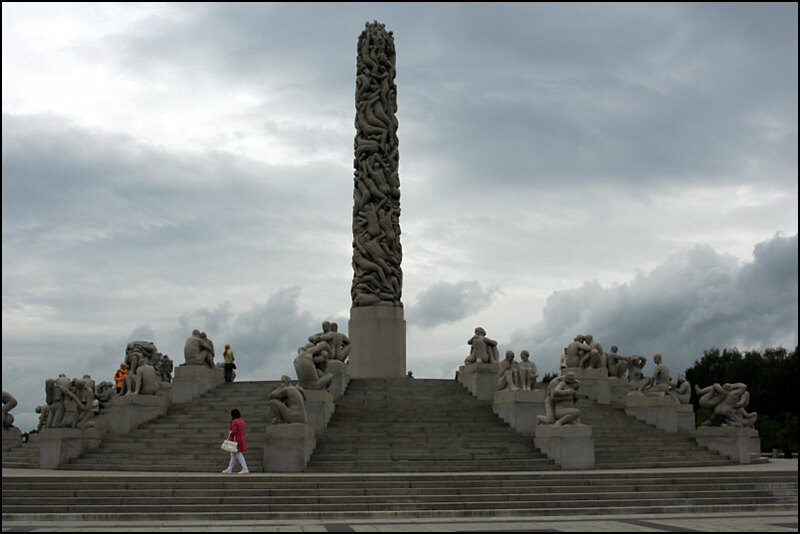 I found it beautiful and moving, sometimes very realistic, sometimes bizarre… The centre piece of the park is the huge monolith in the middle, surrounded by several granite sculptures. 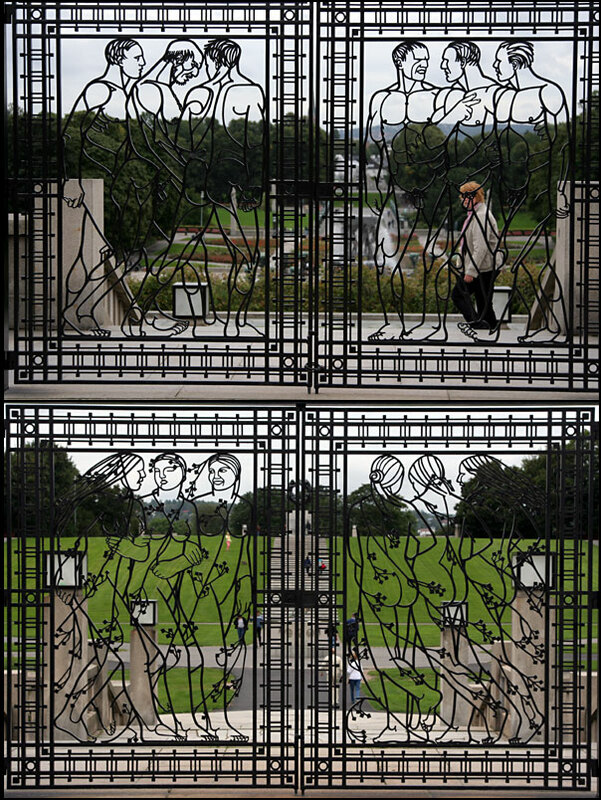 This part of the park has beautiful iron gates. The photo on the left (below) shows 2 details of the big monolith in the middle. The photo on the right shows several of the sculptures found around the monolith. Further down there is a large fountain with a bronze sculpture in the middle. Around the bottom of it are square plates showing small scenes. I put some of these together in a collage (photo on the right) – I especially liked the ones with the animals! 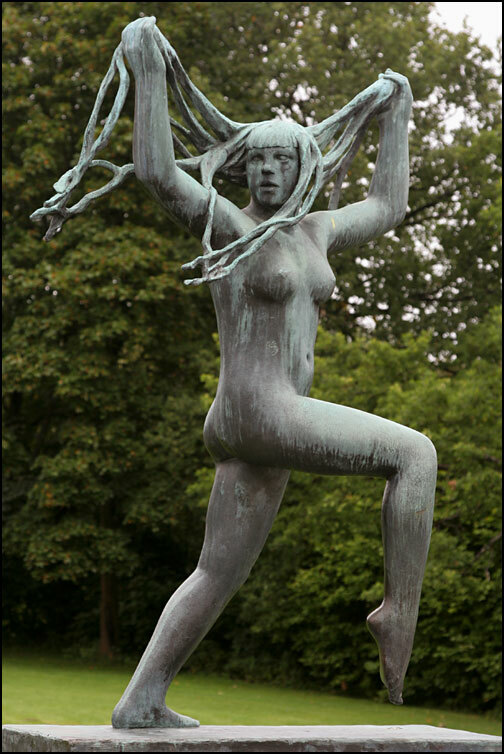 From the fountain to the main entrance (we walked the wrong way round 😉 ) there are several larger bronze statues, like this girl with crazy hair :). 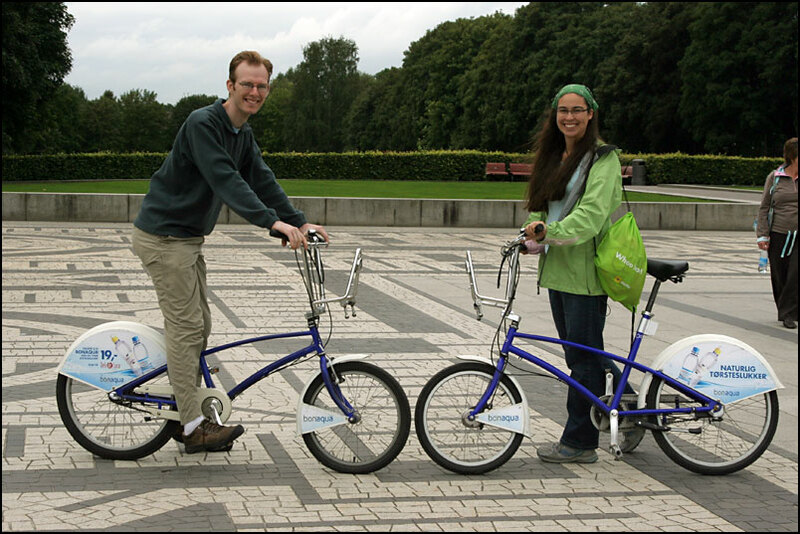 In the other photo Nicole and Patrick are showing off the bikes you can rent all around Oslo. 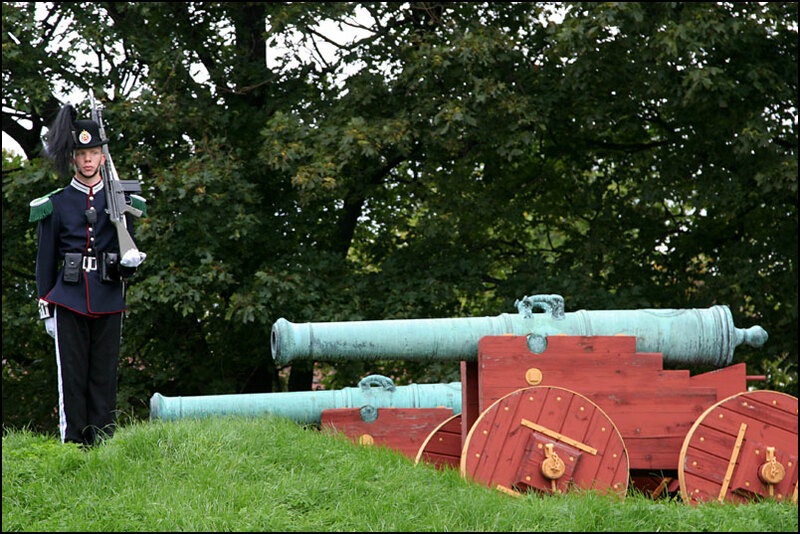 We spent some time around Akershus fortress, where there are soldiers keeping watch, and lots and lots of cannons on display. 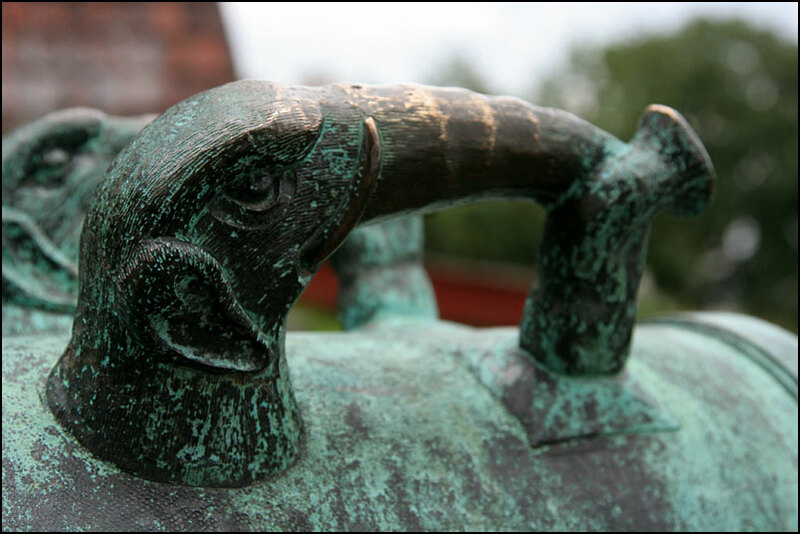 The elephant trunk handles on the cannons are quite pretty! 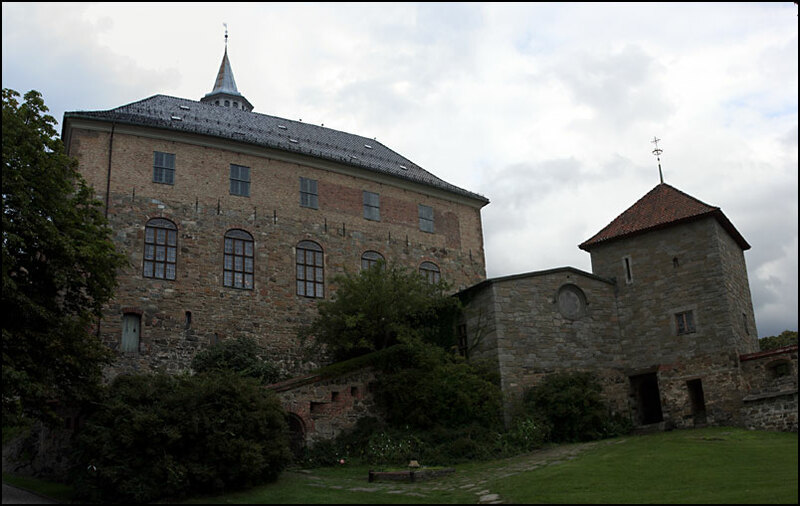 Here is a view of Akershus fortress, and a photo of Patrick and Nicole on the ferry back to Bygdøy – what a nice way to travel! The next day we went to visit the Fram museum. Fram means forward in Norwegian and this was the name of the ship that Fridtjof Nansen used on his expedition during 1893-1896 where he tried to reach the North Pole by letting the ship drift with the sea ice. He didn’t actually succeed in doing this, but FRAM spent 3 years in the ice and everybody survived the expedition, including Nansen and Hjalmar Johansen who set out on ski’s and with kayaks to try and reach the North Pole but in the end had to overwinter on Frans Joseph Land. I find this one of the most incredible tales in Polar history, and I was very excited to visit the museum where you can actually walk around the ship! Fram was also used for an expedition around the Canadian Arctic with Otto Sverdrup, and in Roald Amundsen’s expedition in 1910-1912 where he was the first person to reach the South Pole. The museum was really interesting, and the ship actually looked quite cosy and comfortable inside, though the beds seem a bit short! I’m now with my family in the Netherlands, it’s great to be back for a while! I’m also preparing for my PhD defense which will take place on Friday… I’m quite scared, but also kind of looking forward to it – or at least to having it out of the way 😉 I’m travelling to Norwich on Tuesday already, so I probably won’t update my blog until the end of the week – but hopefully by then I’ll have some good news to share! good luck with the viva!! Succes met je examen morgen! Het gaat vast heel goed, maar het blijft natuurlijk wel errug spannend. We denken aan je!